Featured in this astounding straight-to-video accomplishment: Blatant lip-synching, awesomely generic hard rock, a mustachioed dude in a ZZ Top “Eliminator” raglan sleeve shirt, a guy in a gorilla mask breakdancing, a station named “MVTV,” chicks doing aerobics very intensely, multiple Jacuzzi scenes and one regular bathtub scene, a villain that’s a budget Mike Reno of Loverboy, a song (and character) called “Rainbow Eyes.” NOT featured: logic or reason, professional actors, any attempt whatsoever to present a plausible scenario, any original ideas. It does, however, answer the question of what Eddie and the Cruisers would have been like as a barrel-bottom slasher flick. Somebody was asking that question, right? If you are currently a teenager living in the early-to-mid-1980s, you will love it. The real nadir – besides the banal reveal, that is – is that the above clip omits the movie’s inspirational one-handed hammer-on guitar intro. Have you ever had to shoot a burning demon nun? Yeah, me neither. I know, I know, “the unexamined life” and all that, but I’m all right with missing out on that experience. Now, I rarely get overexcited about seeing some new scary movie or another, even though I obviously devote a lot of my time to watching the damn things and then divulging the experience here, but I found the promos for this one very compelling – and that was before I realized it was related to The Conjuring. So how critical would I be, I wondered. Well, I can tell you this flick is not perfect. 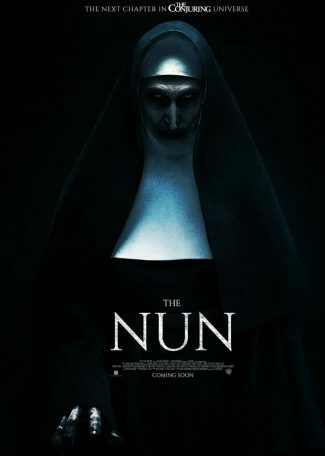 At times, it pushes the boundaries of acceptable hocus-pocus, even as the script concerns a malevolent spirit inhabiting a Romanian cloister and the novitiate who must do battle with said evil entity. The subtleties are nearly sublime, however, and the masterful underplaying of some key frights is a definite plus. Unfortunately, at a certain point things go overboard, as if the writers felt compelled to add every last malefice they could imagine. Probably they could’ve saved some for the sequel. A lot of very strong imagery is propounded here, and pretty impressive levels of blasphemy, too. I enjoyed both The Conjuring and The Conjuring 2, so much so that I also saw Annabelle. Plus, demon nun. Honestly? It’s not essential. It is a good time, though. 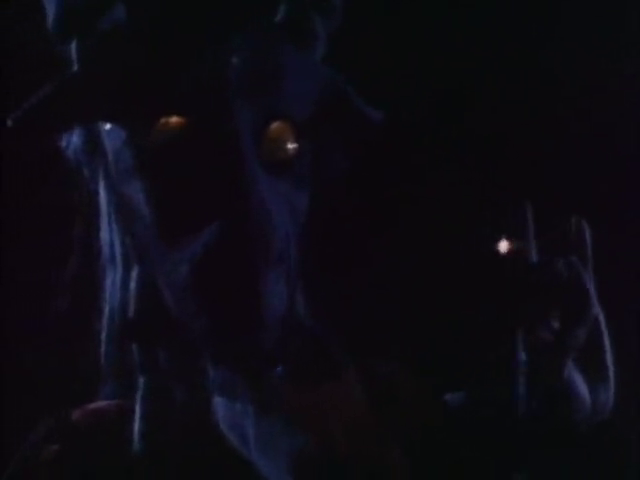 This won’t sound promising, but the opening sequence was tremendous; other than that, a few of the more ominous scenes involving the residents of the abbey were the best this film had to offer. The overkill mentioned above threatens at times to turn the proceedings into an action film. ultra muchos, inc./river city films, inc.
All right, so retconning this flick to be the sort-of “sequel” to the 1974 original makes sense. It’s at least half great: the first 45 minutes of this black horror comedy work well as a pastiche of the first go-round, with the added amusement of more modern horror motifs … which are basically updates of the original’s template anyway. Both unsettling and darkly humorous – much as the debut was meant to be, and Part 2 purported to have been – first-and-only-time director Henkel outdoes his former writing and production partner Tobe Hooper’s juvenile second chapter with a bit more sophistication. The latter half of the picture, meanwhile, spirals wildly out of control, plot-, production- and performance-wise. Becoming kind of a mashup of The Rocky Horror Picture Show and The X-Files, with a passel of other film references tossed in haphazardly, it retains a tinge of the on-edge emotion of the original. It lacks in the hazy, disturbed intensity, of course, and also for any slaughtering on behalf of whoever these people are and however they’re allegedly related to the clan this time around. Oh, and this time around, Leatherface is a cross-dressing (wo)manchild. Gawd, I made it this far, I had to. Once again, there isn’t any real reason “Leatherface” even needs to be in this movie, especially as he doesn’t do much of anything except throw an extended hissy fit. And he’s the only plausible link to the first film! (Well, okay, Bernie Lomax Grandpa’s at the table, too.) Strange continuity note: In Leatherface, the generic third installment, “Bubba” has an unexplained leg brace, and in this picture, Matthew McConaughey’s character has a remote-operated battery-powered lower appendage. Yep. Well now, THIS is an unpleasant little flick. I mean, nothing in this picture is going to make a viewer feel very good, unless that viewer has got some serious issues. A few things may make the viewer laugh, sure, but this is a movie that is based around psychological problems brought about by severe child abuse, which it is suggested is itself a manifestation of psychological and/or emotional disability, and which itself is manifested in cruel, ugly, sadistic, misogynistic murder. (If you doubt that description, it involves a special room clad in stainless steel.) Oh, and extreme social dysfunction is added in just for kicks. On the upside, it’s got a disco theme underlying everything, and hallucinated ambulant corpses. Effectively dismal, better than I expected, and a reminder of how much I generally seem to enjoy films from this hopeless and beaten-down time period. As a viewer with some serious issues, this is my kind of picture. If you’re any kind of fan of exploitation flicks, grindhouse features, movies from the late seventies, or psychological problems, absolutely. This is one of the sorts of cinematic spectacles being aped stylistically by contemporary productions such as The House of the Devil or, I dunno, We Are Still Here, maybe. Personally, I enjoyed the mostly fruitless efforts co-worker Bobby makes to try to befriend the murderous lunatic, as I thought Donny the murderous lunatic’s social awkwardness was portrayed brilliantly. In fact, I generally enjoyed Bobby’s presence throughout the proceedings, though I remain baffled by the fact that when he believes Donny is in danger, he fetches local parson Father Gerrity and not, you know, the police. You know, I enjoy listing the multiple titles for some of these pix, mainly because it usually follows that the more different names a film acquires throughout its life of distribution, the more debatable its quality. There are exceptions, of course; every rule has them. This picture could be one of those exceptions. Its sobriquet may have been appended because somebody wisely decided that the original name didn’t make any sense whatsoever. Now, ’tis true that one of the characters in this patently Deliverance-derived flick makes an offhand remark – a barely audible offhand remark, mind you – that the subjects may be the victims of a demonic ritual, but … yeah, that’s not the case. They are, however, being stalked by a deranged backwoods weirdo. In the forests and wilds of Ontario. Including on a river. Despite that derivative handicap, however, the movie’s pretty good. Bonus points awarded because two of the friends here are played by the very same actors who played acquaintances in The Clown Murders, and for the fact that multiple reviewers have compared this affair to 1981’s Just Before Dawn. I may have been misled by the title and synopsis into thinking it contained a “ritual” aspect. Crazy, I know. You probably won’t, but it does manage to link neatly the aforementioned Deliverance (from 1972) to 1982’s First Blood. One supremely shocking scene stands out, as it very well might have in any number of other scary movies, mainly because it so starkly emphasizes how hopeless the situation is for our protagonists. Overall, however, this is just too reminiscent of that earlier blockbuster production I do not want to name again.